While the Boston Red Sox are just a win away from winning the biggest piece of baseball bling - the World Series trophy - teammates Dustin Pedroia and Shane Victorio added some gold to there collections. Pedroia and Victorino were both named 2013 American League Rawlings Gold Glove winners at their respective positions Tuesday. Pedroia led all second basemen with 15 Defensive Runs Saved (a fancy sabermetric calculated on the ability of a player to turn batted balls into outs and convert double plays, relative to their peers). Pedroia's .993 fielding percentage (5 errors/688 total chances) ranked second among AL qualifiers at second base. The award was Pedroia's third career Gold Glove. Victorino had 24 Defensive Runs Saved in right field, the most he’s had at any position in a season in his career. Victorino also had the third-most putouts among AL right fielders (264) and his three double plays tied for second-most. Victorino’s throwing arm also provided significant value. His nine outfield assists tied for the AL lead among right fielders. 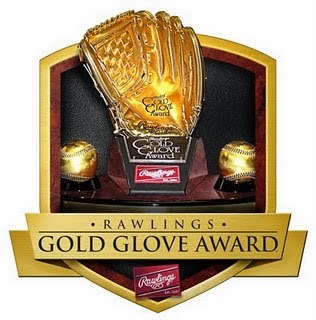 This was Victorino’s fourth Gold Glove, but his first as a right fielder. He previously won three with the Phillies, all as a center fielder. Red Sox center fielder Jacoby Ellsbury lost out to Orioles center fielder Adam Jones. Here’s the complete list of 2013 Rawlings Gold Glove winners from both leagues.